“Barley” is an apparently healthy senior horse that is used for pleasure activities for the family. She presented for general wellness with no current concerns. Acupuncture and laser treatment modalities were used. The owner believes that Barley positively benefitted from the acupuncture and laser with mild positive changes observed on myofascial exam. “Barley” is a 23 year old Quarter horse mix bay mare. The current owners have had her for approximately 5 years. Barley is used as a companion horse and for light trail riding. Previous veterinary history is unknown. Minimal health concerns up to this point. This past winter, she had a hoof abscess of the right rear that was treated by an equine veterinarian in the area. No lab work or imaging diagnostics performed. 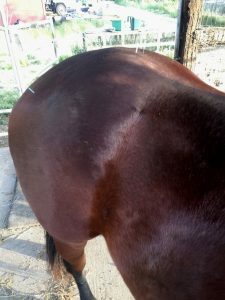 As an older mare, the owner thought she would benefit from acupuncture treatments. I selected points for wellness and trigger point pathology as well as points that the patient was likely going to tolerate for her first acupuncture experience. 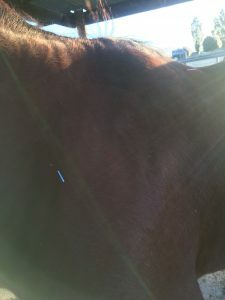 I started with GB 21 as this was one of the first points we would place on horse patients in the course to “test” if they will tolerate other needle placement (when working with Dr. Story and Dr. Holt). This can also have autonomic input and assist in calming/relaxation. In addition, Barley had some muscle tension in her neck region so GB 21 was used for local tender points in combination with laser therapy to influence the connective tissue by re-organizing the collagen fiber, disrupting the motor endplates, and increasing blood flow to the site. I also selected bai hui as a second placement point for a few reasons. First, Dr. Landes used this as his first point on every horse so I elected to use bai hui as one of those “testing” points. I also selected it for its role in back pain, lameness, and pelvis limb pain (history of right rear hoof abscess). This point also complements nicely the BL 54 and BL 27 points used on the mare. BL 27 also used for parasympathetic innervation and small intestine back shu point. Although distal limb points may have been beneficial, it was not tolerated in this case. ST 36 would have been used for parasympathetic neuromodulation, anti-inflammatory effects, and gastrointestinal health. Assisting in GI health stems from the effects on the vagosympathetic trunk as the point ascends to the nucleus tractus solitarius and helps with GI motility. BL 25 used for local trigger points as well as digestion and appetite effects. BL 15 used for local sensitivity but elected to not try this point on the first visit (used on follow up treatments). BL 15 also used for anxiety (if that was why she was shaking when needles were being inserted). The points on the back use sympathetic routes to influence. The main goal on Barley was for treatment of tense regions and general wellness. Performed at owner’s home in her small paddock after her dinner feeding. Initial acupuncture and laser treatment (5/22/18) – Blue seirin needles (0.20×30 mm). Bai hui, GB 21, BL 54, BL 27. Dry needling for approximately 20 minutes. Laser (companion class 4) performed on neck for 6 min 30 sec on each side of neck at 12W (continuous wave with 980nm and 810nm wavelengths). She seemed to be unsure of needles when they were going in (acting like they were flies). However, once the needles were in, Barley enjoyed her initial therapy. The needles used seemed the appropriate size. In the future may consider more needles along thoracolumbar region and distal points if tolerated. Second acupuncture and laser treatment (5/29/18) – Blue seirin needles (0.20×30 mm). Bai hui, GB 21, BL 54, BL 25, BL 27. Pink seirin needles (0.23x30mm) – BL 15. Dry needling for approximately 20 minutes. Laser (companion class 4) performed on neck for 6 min 30 sec on each side of neck at 12W (continuous wave with 980nm and 810nm wavelengths). Third acupuncture and laser treatment (6/718) – Blue seirin needles (0.20×30 mm) – bai hui, GB 21, BL 15, BL 54, BL 25, BL 27. Dry needling for approximately 20 minutes. Laser (companion class 4) performed on neck for 6 min 30 sec on each side of neck at 12W (continuous wave with 980nm and 810nm wavelengths). Owners report that patient did well after acupuncture and laser treatments. They didn’t see any change in her normal everyday behavior. However, the owners noticed Barley seemed to lope out easier on trail rides and riding her seemed more smooth. No other significant changes noticed. Below are resources utilized for decision making in this wellness case. 2. Napadow V, Ahn A, Longhurst J, et al. The status and future of acupuncture mechanism research. Journal of Alternative and Complementary Medicine. 2008;14(7):861-869. 3. Schoen A. Equine Acupuncture: Incorporation into Lameness Diagnosis and Treatment. AAEP Procedings Vol 46, 2000. This case showed me that more needles is not necessarily better. Barley would tolerate approximately 5-10 needles at each visit and wouldn’t accept any distal limb points. However, she benefitted from the minimal therapy with both modalities. The owner continues to report that the patient now picks up her right hind with ease when the owner picks her hooves. She also says the the patient is more fluid in her movements when riding her. 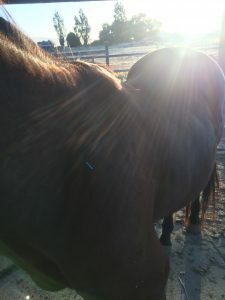 The owner is also convinced that the patient recovered from her colic episode (8/6/18) more easily and quicker due to the history of previous acupuncture treatments.